Lantz Security is a full-service private security firm, providing armed and unarmed security services, vehicle patrols, alarm response services, armed executive/celebrity services, reception/concierge services and special events security. We operate a 24-hour Dispatch Center and extensive supervisory support for all of our professional guards to handle any incident on your site. 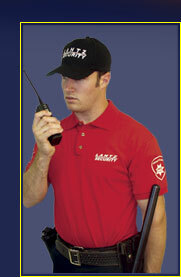 Lantz Security services Ventura County, Los Angeles County, Antelope Valley, San Bernardino County and surrounding areas. Our corporate office is located in Westlake, California with additional operations centers in Lancaster and Valencia, California. The current economic situation and the resulting rise in crime has drained the response capabilities of public law enforcement and emergency services. Private security is more important than ever! That is why Lantz Security employs over 150 professional officers and operates a fleet of 20 fully-equipped patrol vehicles. We have the necessary manpower to provide continuous, reliable security services with the ability to supervise, respond and support all client locations with locally stationed patrols and field supervisors. Our local operations centers and 24-Hour Dispatch Center service provides our clients a unique level of attention and unparalleled emergency support 24-hours a day, 7-days per week, 365 days per year. Lantz Security services industrial sites, corporate facilities, retail shopping centers, commercial real estate/office buildings, Homeowners Associations, apartment home communities, State, County, Local Fairs, government sites and some of California’s largest developers and builders. With a seasoned management force, Lantz Security has developed, implemented and managed the continual operations of customized and highly specialized programs for many of these client locations. Because we have provided security for former U.S. Presidents, high-ranking government officials, high-profile business executives, A-List Celebrities and exclusive gated communities, we maintain a strict code of confidentially. Our personnel follow military-like confidentiality guidelines to protect your anonymity and are required to sign confidentiality agreements to be in our employ. Our extensive client database is also encrypted against Internet hackers and other forms of Internet breeches of security. Copyright © 2005-2019 Classic Security Systems, Inc. (DBA Lantz Security) - Website Maintained by R Computers.